Want to track your Formidable Forms conversions to see which forms are most loved on your site? With Google Analytics, you can track your forms conversions, but it’s got quite a learning curve for beginners. 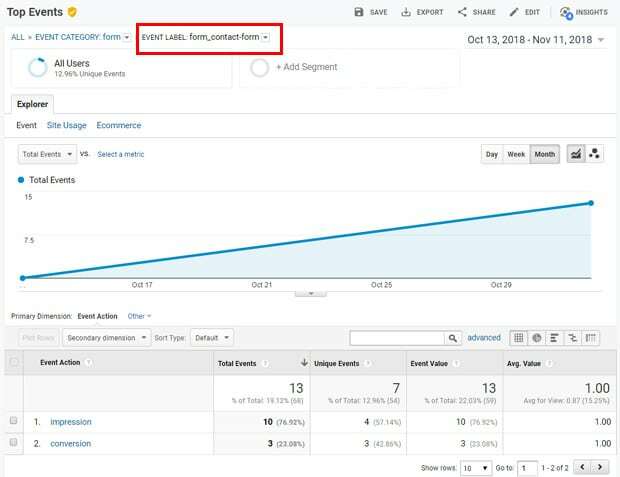 Fortunately, there’re smart tools like MonsterInsights to help you set up forms tracking and other advanced events trackings easily in Google Analytics. 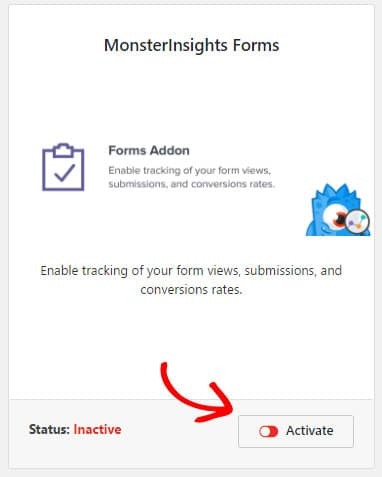 In this article, we’ll show you how to track your Formidable Forms conversions with Google Analytics the easy way: using MonsterInsights. Formidable Forms is the most advanced WordPress form builder plugin available on the market. The plugin lets you create advanced forms like quizzes, surveys, payment forms, registration forms, directories, job board listings, etc. easily. It’s one of the best form builder plugins for WordPress. 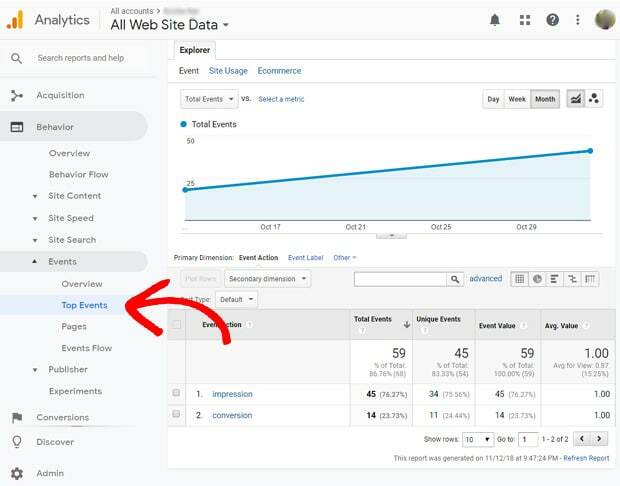 If you choose the first method, you’ll need to set up event goals in Google Analytics’ interface and define your form conversions as event goals. This method is the far less user-friendly approach. If you aren’t a developer, it’ll take a lot of your time and effort to learn, or take a lot of your money to hire a developer. Whereas the second method is speedy and effortless. It takes just a few steps to set up forms tracking in Google Analytics using MonsterInsights. 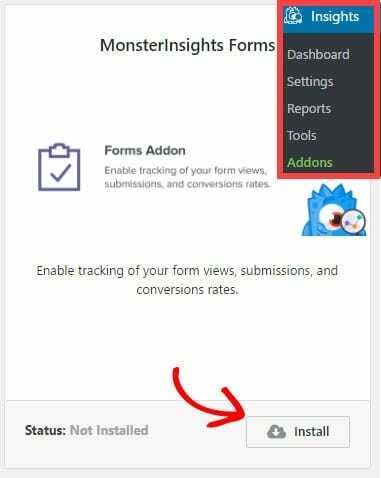 All you need to do to set up forms tracking is to install the MonsterInsights Forms addon in your WordPress dashboard. Then, MonsterInsights handles the rest automatically. MonsterInsights is the best Google Analytics plugin for WordPress. It simplifies the entire process of using Google Analytics on your WordPress site. It comes with a set of simple-yet-powerful addons, like the Forms addon, to allow you track advanced metrics easily. Easy and quick setup: You can set up forms tracking on your site easily, in just a few minutes. You’d need to spend a lot of time and energy or hire a developer to set up forms tracking otherwise. Set up and view reports within your WordPress dashboard: You can set up forms tracking and view your forms reports within your WordPress dashboard. Hence, you can keep working on your site while viewing your Analytics reports – you don’t need to navigate away from your site. 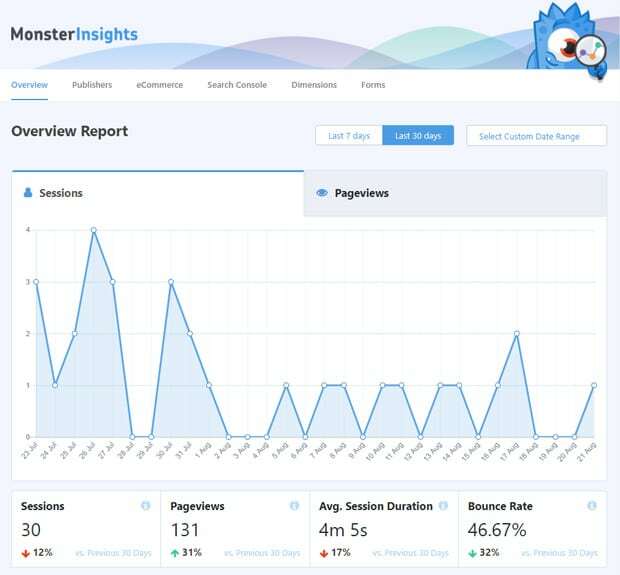 Most comprehensive reports: MonsterInsights provides you with most comprehensive reports for all your website metrics. 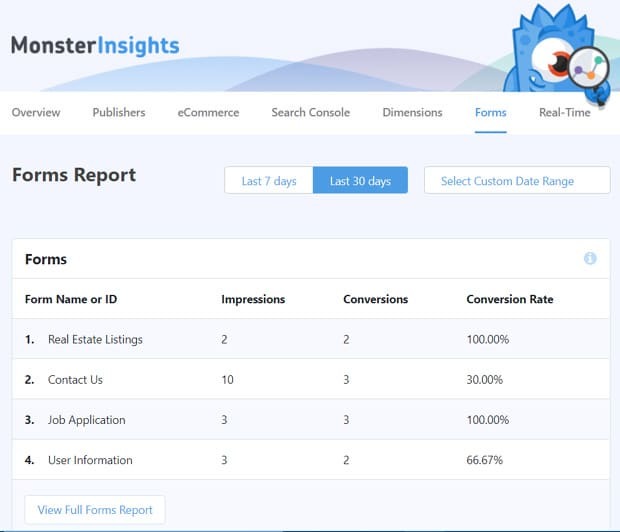 Your forms conversion reports in MonsterInsights are way more simple and easy to understand than in the Google Analytics platform itself. Works with your favorite form builder: Alongside Formidable Forms, MonsterInsights supports all the major WordPress form builder plugins including WPForms and Ninja Forms. Clearly, using MonsterInsights Forms addon is the best option for tracking Formidable Forms conversions. You can buy MonsterInsights Pro to enjoy this feature. First, install the MonsterInsights plugin on your WordPress site and set up Google Analytics using the plugin. After that, navigate to Insights » Addons from your WordPress dashboard and find Forms Addon. Then, click the Install button. You’ll see the button change to the Activate option. Simply click the button to activate the addon. After that, you’ll see the addon’s status as active. That’s it! You have completed the setup process in literally 2 clicks! Now, the plugin will automatically start tracking your Formidable Forms conversions. Normally, Google Analytics takes 24 to 48 hours to track events like form conversions, so you can check your reports after the given time. Now, let’s go ahead and learn how to view your form conversion reports. With MonsterInsights Forms, you can view all your important website data right in your WordPress dashboard without having to open another website. Yes, that’s right! You can view your forms conversion reports inside your dashboard as well. To view your forms reports, go to Insights » Reports from your WordPress dashboard. There, you’ll see the Overview Report of your entire site. To view your form reports, click the Forms link. Then, you’ll see your Formidable Forms reports just like in the screenshot below. The first column from the left is the list of your Formidable forms’ names. The second column is the number of impressions, and the third is the number of successful form submissions. The last column shows the conversion rate for your forms. It’s very simple and easy to understand! Now, if you want to view more details regarding your form conversions, you can click the View Full Forms Report button at the bottom of the report. 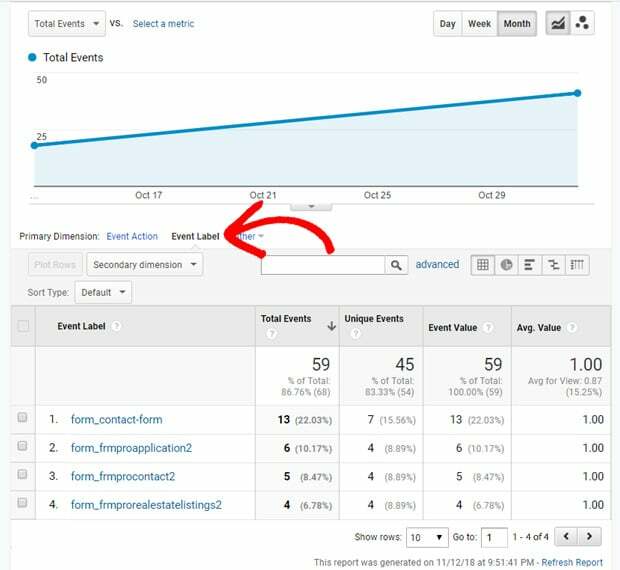 Doing so will redirect you to Google Analytics » Behavior » Events » Top Events in your Google Analytics account. If you aren’t already logged in, you’ll need to log into your Google Analytics account to view this report. As you can see above in the screenshot, it shows the total impressions and conversions triggered by all your forms. If you want to view the events for each form individually, click on Event Label link in your Forms report Primary Dimension. Now you’ll see the total events for each of your Formidable Forms forms individually. Total events include both impressions and conversions for your forms. If you want to see impressions and conversions separately for each form, click your form names one-by-one. We hope this article helped you learn how to track your Formidable Forms conversions with Google Analytics. If you found MonsterInsights useful, download it today! You may also want to see our detailed guide on how to find real-time reports in Google Analytics.